Tracking modes let the drone make decisions about its flight path, and it works surprisingly well. As mentioned last week, Lensrentals.com has drones! I can see you opening another tab to reserve your copy (wave to the drone flying outside your window), but first, let’s take a minute to find out which one best suits the needs of your shoot and free-flying spirit. 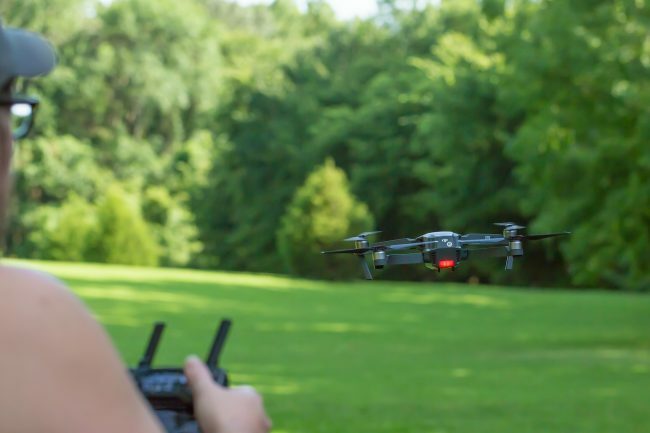 You may already be acquainted with drones from that time your dad flew a freshly unwrapped quadcopter into grandma’s hair, cousin Dale’s eye, and then nested it in a tree during that infamous holiday gathering. We won’t talk about that. 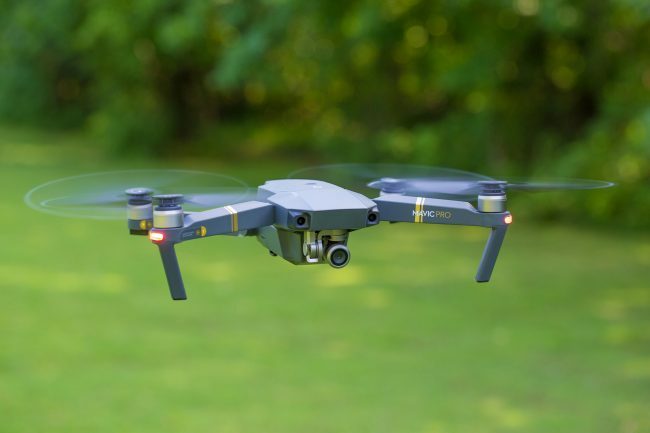 Nevertheless, as with most technology, affordably priced drones have gotten much smarter in the last couple years, so it’s worth revisiting your options. We are currently stocking three drones from DJI that range from hobbyist grade to professional. I’ll use the rest of this article to compare their features and prices so you can make the best decision possible for your rental. The Mavic Pro is compact enough to carry everywhere so you can always ready for a quick flight. Fold up rotor arms and propellers keep the package small but don’t compromise the Mavic’s agility in any way. Our first drone, and the one that I will always recommend as a first rental is the DJI Mavic Pro. Some eye rolling may happen because of its entry level position in DJI’s line up, but its front and rear collision avoidance, small size, and snappy maneuverability make it a great drone to test your level of skill and comfort before hanging $10,000 worth of equipment from the rotors of the Inspire 2. The Mavic Pro is classified as a miniature UAV, weighing a paltry 1.62 pounds. It also has foldable rotor arms which trivialize the decision to take this drone everywhere with you, ready to launch into the air within a time span measured in seconds. 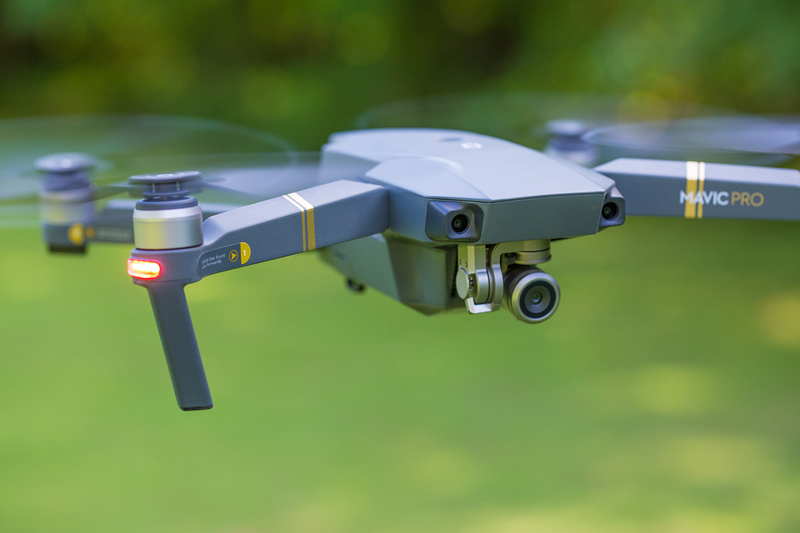 The DJI Mavic Pro offers multiple ActiveTrack options for locking onto subjects such as people, vehicles, and pets from predetermined angles or in free flight. The gesture mode allows for hands-free selfie snaps but seems like more of a gimmick at this stage, and tripod mode limits speed to 2.2 mph for smoother and more precise movements. Takeoff is automatic, and landing can be as simple as a button press on all of our DJI drones, returning the drone to the GPS locked location where it took off from and lowering itself delicately onto the ground. Flight control is handled by a small, sturdy twin-stick controller that has fold out arms on the bottom designed to grip onto your smart device. The size of the controller and position of the sticks feel good even in my large-ish hands, and the device holder can accommodate up to an iPad Mini for a pretty large control screen and camera display. Smooth camera movements will certainly take practice in manual flight, the hardest movement being gimbal tilt. It is controlled by a small spring loaded dial on the left side where your forefinger rests and just isn’t precise enough to avoid jerky movement. Control distance is reported as the same on all three drone models at 4.3 miles, but in normal use, drone connection drops out before reaching 3 miles. This is still a pretty spectacular feat and will satisfy most pilots flying within the FAA guidelines suggesting line-of-sight. The DJI Mavic Pro feels fast. In reality, it has very similar speeds to the Phantom 4 Pro, but its smaller footprint and lighter weight make it so much more fun to fly. In collision avoidance modes, 22 mph keeps you moving at a safer speed, but providing you trust your piloting skills to avoid collisions, sport mode can be turned on to get the Mavic up to speeds of 40 mph. 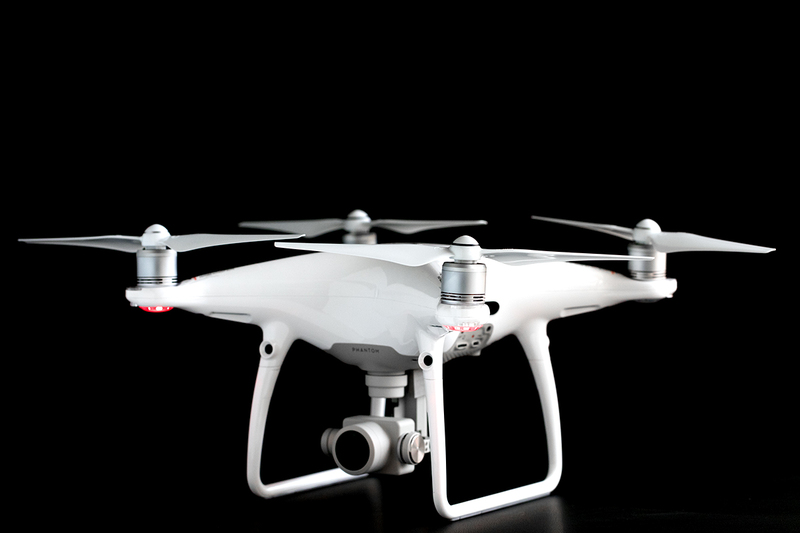 At all speeds, the footage is smooth, and you feel in control of your flight path. The wind can be an issue, and you should expect to see the gimbal shake at higher speeds. DJI squeezed a lot into the tiny gimbal and camera on the Mavic, but image quality is still its weakness. The photo and video capabilities are the real weak point of this drone. It will record up to 4K footage and shoot RAW 4000x3000px images, but the quality of the two are not professional grade. The dynamic range of the camera is limiting, and in anything other than full daylight, noise in the shadows is a problem. The 120fps mode is unusable because of extreme aliasing from what I would assume is sensor line skipping to achieve the effect. You will notice some of this in footage shot at frame rates higher than 30p. Once you feel comfortable flying the Mavic, you should take off the clear gimbal cover included with the drone. Glare is unavoidable with it installed. The latest successor to the drone that kicked it off for DJI is where I would start if I wanted to use the photos and video in professional scenarios. The DJI Phantom 4 Pro has similar video specs on paper to the Mavic Pro, but having a sensor that is twice as big and adjustable aperture control improves the most disappointing areas in the DJI Mavic Pro. I start with the photo and video capabilities on this particular drone because I feel that’s its strongest asset. It’s is more of a photographer or videographer’s tool than the Mavic, but isn’t as much fun to fly. You can tell when you push and pull the sticks hard that the weight of the Phantom 4 Pro is doubled from the Mavic. The Phantom’s design hasn’t changed much since its first iteration, and that design is holding it back in the modern era. What once was sleek is now bulky. However, when used as a tool and not a toy, it can get some great images. H.265 at 100Mbps allows for greater image detail, and the included d-log profile helps to expand dynamic range a little bit. D-log is not as robust as other brands’ log video profiles, but I appreciate any extra post processing options. RAW photos at a 3:2 resolution of 5472x3648px show the full capabilities of the sensor, and in the right lighting conditions, are stunning. The Phantom 4 Pro is touted by DJI as the “safest” drone ever manufactured. Despite being some first class marketing speak, they are probably correct in saying it. The drone has obstacle detecting sensors in 5 directions. That’s every way but up, and they are good for avoidance at speeds up to 31 mph. The aptly titled draw mode is unique to the Phantom 4 Pro. Waypoints can be drawn with a finger on the screen to allow more emphasis to be put on camera control. The Phantom also has very similar ActiveTrack capabilities to the Mavic. Additionally, the controller for the DJI Phantom 4 Pro has a better form factor than the Mavic. Its larger size gives you more to grip, and the smart device mount puts the screen front and center. You also get a dedicated home button which I found mostly useless. Flight distance is reported to be the same, but I had noticeably more dropouts at closer ranges with the copy I tested in both 2.4 GHz and 5.6 GHz modes. The biggest fault of the Phantom 4 Pro is agility. Everything just feels a little slower despite having a higher reported top speed. The wind definitely affects the Phantom more, likely due to its larger body. I’ve read multiple reports of this that corroborate my personal experience. 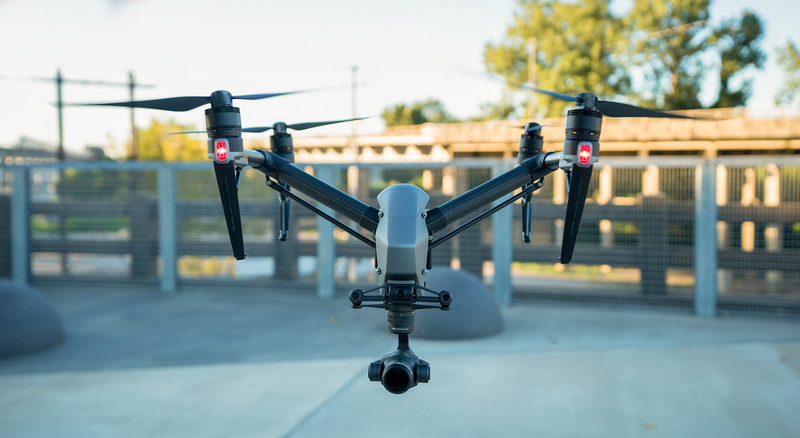 The Inspire 2 pairs its intimidating looks very well with a surprising amount of speed and agility. Photo by Phillip Pettit. The pinnacle of quadcopters from DJI is the Inspire 2. At first glance, the resting appearance of the drone is intimidating (something between Boba Fett’s Slave 1 and an Alien/Predator hybrid). It can make you feel a little uneasy before you even consider how much money is about to soar through the air, and the most impressive, or daunting, spec on the sheet is just how fast it can do it. The DJI Inspire 2 tops out at a blazing 57 mph. For new drone users, that feels incomprehensibly fast, and despite its large frame and weight, the drone feels very easy to maneuver. Of course, from 57 mph it will take a couple of seconds to stop, but not as long as I thought it should. 0-50 mph in 4 seconds will keep up with most subjects with the side effect of making your palms a little sweaty. Drone control is upgraded here as well. Aside from the gimbal camera, you have a new possible perspective from the two-axis stabilized FPV camera mounted at the drone’s nose. With two cameras, flight and gimbal duties can be split between two operators, and it can be fun to fly via the FPV camera just to see how hard the Inspire is banking to make those fast direction changes happen. The controller is largely the same as found with the Phantom 4 Pro. There is an HDMI out on the Inspire controller for additional monitoring options, a GPS module port, and manual raise/lower switch for the motorized landing feet. The control sticks are tuned for finer control compared to the Mavic and P4P, but you’d be hard pressed to notice the difference if the units weren’t sitting beside one another. As far as control modes, the DJI Inspire 2 gets a new one thanks to its 360-degree rotating gimbal. DJI calls it Spotlight Pro, and it lets the drone keep a single direct flight path while tracking an object using just the gimbal. Return To Home functions a bit smarter by flying a mirrored path back to the user during a complete signal loss. ActiveTrack and TapFly features carry over from the Mavic and Phantom 4 Pro. The Inspire doesn’t have all of the obstacle avoidance of the Phantom 4 Pro so keep in mind that you’re only protected by sensors on the front and rear. Battery life is up to 27 minutes with dual batteries, but be sure to keep batteries charged to similar percentages because the drone is picky about matched voltages. Batteries self-heat and should allow for more dependability in colder weather. Battery charging is fast, but do keep in mind you’ll need twice as many as with the other two models. Here’s where the DJI Inspire 2 can get a little confusing. Unlike the DJI Mavic Pro and DJI Phantom 4 Pro, the Inspire 2 has an interchangeable lens system. Right now there are two options for gimbals to connect to that mount, and they pretty drastically alter the video capabilities of the drone. The first and simplest is the X4S gimbal. This gimbal has an integrated lens with identical capabilities to the one found on the Phantom 4 Pro. With this gimbal, the only option for recording is up to 4K 60 fps via the microSD card. Again, just like the P4P. Your second option is the X5S gimbal. This gimbal requires supplementing a micro 4/3 lens to work with its micro 4/3 sensor. It works much like the X5 gimbal that you may have used on one of our Osmo Pros. Keep in mind there is a limited list of about ten lenses that will work, so you’ll want to consult that when placing your rental. The X5S opens up your recording options to ProRes (422 & 4444) and RAW at 5.2K 30 fps. These codecs are not available for use with the X4S gimbal even if you have the licenses installed to the Inspire 2. Using these codecs also requires the use of a proprietary SSD called the DJI CineSSD and a matching CineSSD reader. Photo workflows are largely unchanged with the only upgrade being a continuous burst for RAW photos recorded to the CineSSD slot. This article would not be complete without a brief warning to you potential drone pilots. Since LensRentals started allowing employees to rent these drones, three have been crashed. Two of those were catastrophic enough to warrant sending them into DJI. This has happened in less than the span of a month. The safety features and ease of use of these products need to be paired with a large helping of caution. None of these drones will safely avoid all obstacles all the time, and I’d suggest flying as if the obstacle avoidance systems weren’t there at all. Take your time, learn the controls, and fly safely. It’s decision time. Which drone is right for you? If this is your first drone rental, go with the DJI Mavic Pro. It’s a great way to learn the basics of drone control and a comparably low risk. The DJI Phantom 4 Pro is a mid-tier option I’d recommend for pilots that want great image quality, but don’t need the speed boost or RAW capabilities of the DJI Inspire 2. Again, if the video and photos aren’t your priority, and you just want to have a bit of fun, I’d stick with the Mavic. The small improvement to battery life and a few extra features aren’t enough to justify the price difference. Lastly, the DJI Inspire 2 is the drone for experienced users that need the absolute best option for photos or video and the ability to keep up with very fast moving subjects. Be warned. One little taste of the DJI Inspire 2 may ruin the allure of less capable drones forever. Area is the important thing when talking about sensor size. Then P4P sensor is roughly four times the area of the Mavic, not twice. Just a minor correction, the Mavic does not have rear collision avoidance detection, only front. Haha. I’ve seen it happen with my own eyes, and I’ve heard tell of many more. Good catch! I’ll get that edited. Great read! Just a note, the Mavic Pro does NOT have rear collision avoidance, only front and ground. Just take a look at the crash compilations on youtube… nearly all of them involve flying backwards into a tree! I understand. Great article BTW. I’m not our legal department, so I’ll stay away from that bit of your comment, but the three wrecked drones were first time pilots. If following the rules laid out by the FAA and linked when accepting the terms of the rental, drones shouldn’t be in a position to harm someone. I will continue to urge caution for sure. Thanks for reading!